Scarifying is the best treatment for a healthy looking lawn, this Powerline scarifiers ensures that you lawn is in the best health in the spring and the autumn. This is achieved by getting the perfect amount of air into the turf. With each application of the Powerline scarifier, moss, grass remnants, thatch and weeds are removed, and the grass roots are optimally supplied with nutrients, air and water. Robust 4-wheel electric scarifier. With central depth adjustment and effective serrated blades. 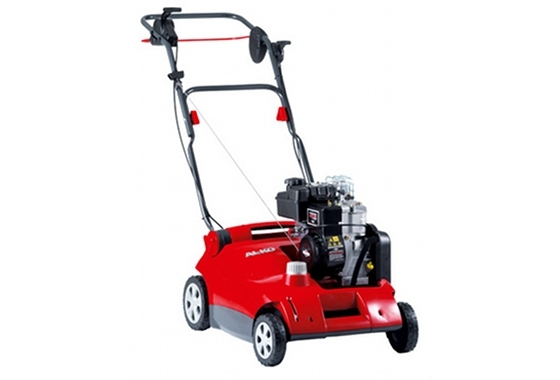 With added benefit of a high-performance Briggs and Stratton petrol engine for larger lawns. Air for the lawn: 16 specially shaped serrated blades made from hardened steel on a dual bearing supported scarifying shaft ensure that the turf gets adequate air. Right working depth: central working depth adjustment with just one hand motion. Features a neutral setting for protecting the blade during transport. For your safety: the handle bar with practical cable strain relief automatically stops the motor when it is released. Making space: the scarifier can be folded together in seconds with only a few hand movements, meaning it can be stored away neatly in the smallest of places.